Lush green fields, rolling hills, native bush and a relaxed lifestyle - that's Golden Bay. This farm captures all of that and more. This is a golden opportunity to secure a rural business in a strategic and brilliant location. 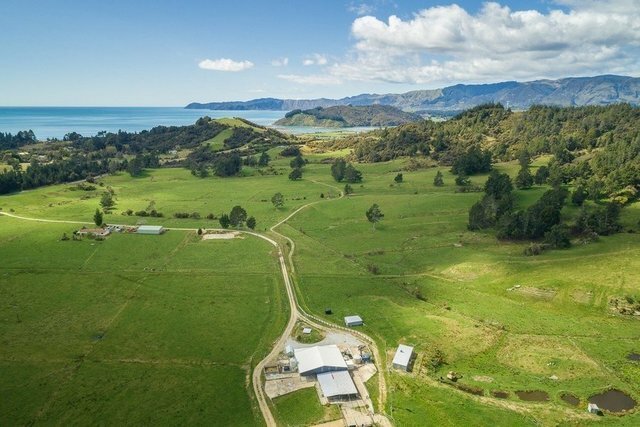 With the sea not far away, the farm is elevated above the coastal area and has flat grass paddocks leading to rolling, bush clad hills, with the Little Onahau river flowing through the property. Golden Bay weather is superb for grass, and the farm has 185 hectares (approx.) of grazing in over 100 paddocks. Abundant tall trees and bush provide diverse grazing and a gentle landscape, with plenty of water and shelter for the stock, as well as carbon credits and honey. Previously a dairy farm, based on organic principles (never certified) the farm is now operating as low impact grazing. The dairy farm infrastructure is mostly there: a large new dairy shed has been partially implemented but not finished. There are three other sheds, workshop and water reticulation you'd expect for a small dairy farm. The intended new dairy shed is an opportunity: although developed for robotic milking, things changed and it was never completed. It's now a large, well insulated and potentially multi-purpose facility. The next owner has the opportunity to make it what they wish. See more in our property Information Memorandum. The property has two houses and a sleep-out. The four bedroom farmhouse (built in 1986) is in original condition. The second house (1990's and four bedrooms) has been rented out but is currently vacant. Both have potential to become something special. This farm could be whatever the next owner desires it to be. Near the airport and the main road, it could be a robust tourist and/or farming enterprise. The farm is a portfolio of options - dairy, cheese, grazing, tourism, accommodation. A wonderful lifestyle and challenge awaits.